Your Carpet Looks Clean, But Is It? Your carpet is a haven for dust mites and dander, and really increases allergy symptoms. But you can combat the situation by vacuuming regularly. or getting your carpet professionally cleaned annually or semi annually. There are also indoor air cleaners you can install which will help remove more allergens that a regular furnace filter does not catch. Did you know that air fresheners are actually indoor air polluters? Whether they plug in or are “spritzed” into the air, almost all of them contain ingredients with toxic qualities. To keep your home’s air clean and healthy, consider adding more potted plants indoors. 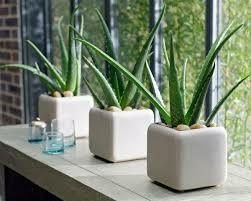 Plants, like aloe, can liven up your living space while freshening up your indoor air. We can provide more information on IAQ product up grades, call today. 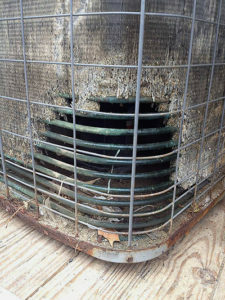 Shown here is coil damage from a pet’s daily business causing a bigger issue over time. Do You Know Where Your Pet is Marking it’s Territory Daily? 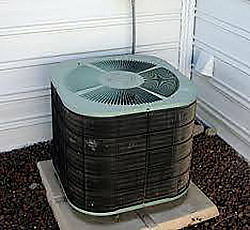 Animal urine can be very harmful to your outdoor A/C unit. Shown here is a dryer vent placed too closely to the outdoor unit. Do You Know Where Your Dryer Exhaust Vent is in Relation to Your Outdoor A/C Unit? 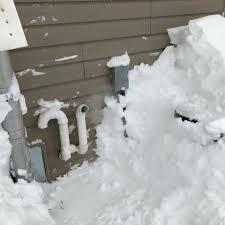 Daily we see dryer vents dumping their fluffy exhaust straight onto outdoor A/C or Heat Pump units robbing the unit of proper air flow. This can cause premature damage to the unit & efficiency loss. A Trim Lawn Looks Great! Always be sure that lawn clippings are aimed away from your outdoor unit when mowing is done. It helps to keep plants trimmed back and placed away from your unit as well when landscaping. As an extra step, it is a good idea to make sure the unit is not running when mowing, yard work, or other landscaping is being done that will throw debris into the air around your unit. When your unit is running it will attract more debris, which is likely to stick to your coil, because of the direction of air flow it produces. Shown here is an exhaust flue that was supposed to be safely exhausting the Carbon Monoxide produced by 3 furnaces in an apartment building. On location installing a new A/C- Pride Mechanical, Inc. found this issue, repaired it, and the tenants have now gotten detectors. How Do You Know the Deadly Carbons That Your Furnace and Hot Water Heater Produce are Being Safely Exhausted From Your Home? 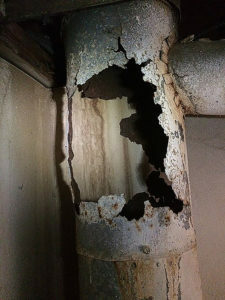 Finds like this show the importance of doing annual maintenance by professional technicians to prevent dangerous problems like these from developing over time and going unnoticed. It is also why you should have Carbon Monoxide detectors on every level of your home, whether it be single or multi family dwelling, new or old home/HVAC system, and even when you do have maintenance done annually. Do You Check Your Smoke Detector Regularly? What About Your Carbon Monoxide Detector? Be sure to check not only your Smoke Detector for proper operation, but your Carbon Monoxide Detector as well. It is always a good idea to change the batteries once a year & test the unit. If you do not have a Carbon Monoxide Detector you should consider getting one. Especially if you have children or elderly living in the home, it could be a life saving decision.